Glico ice cream has been officially launched in Thailand. Glico’s ice cream launch in Thailand will see its ice cream products distributed nationwide. 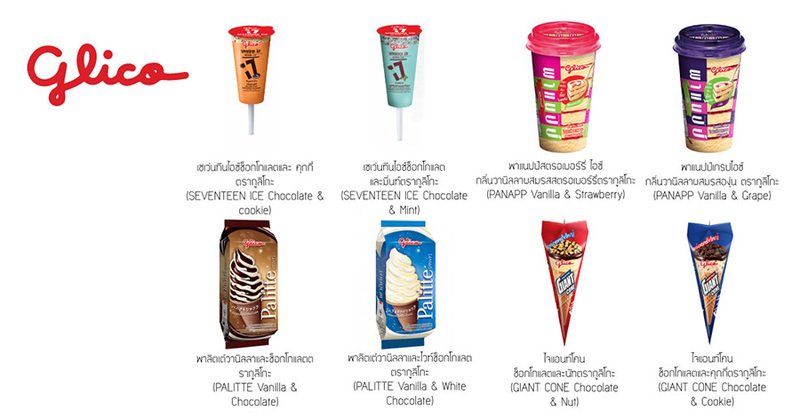 The products available are Palitte (Vanilla & Chocolate, Vanilla & White Chocolate, Giant Cone (Chocolate & Nut, Chocolate & Cookie), Panapp (Vanilla & Strawberry, Vanilla & Grape) and Seventeen Ice (Chocolate & Cookie, Chocolate & Mint) . 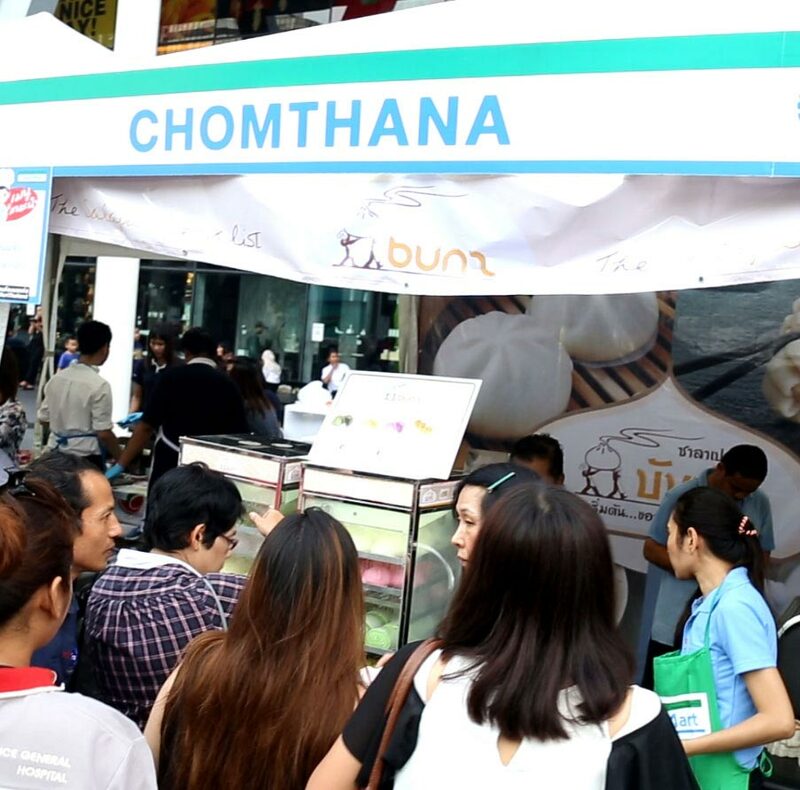 Chomthana, Thailand’s leading ice cream manufacturer, will be responsible for all sales in Thailand’s upcountry provinces. For all parties interested in purchasing Glico ice cream, please contact: (+66)2 263 0550. Chomthana is committed to creating a ‘greener’ and more environmentally sustainable future. 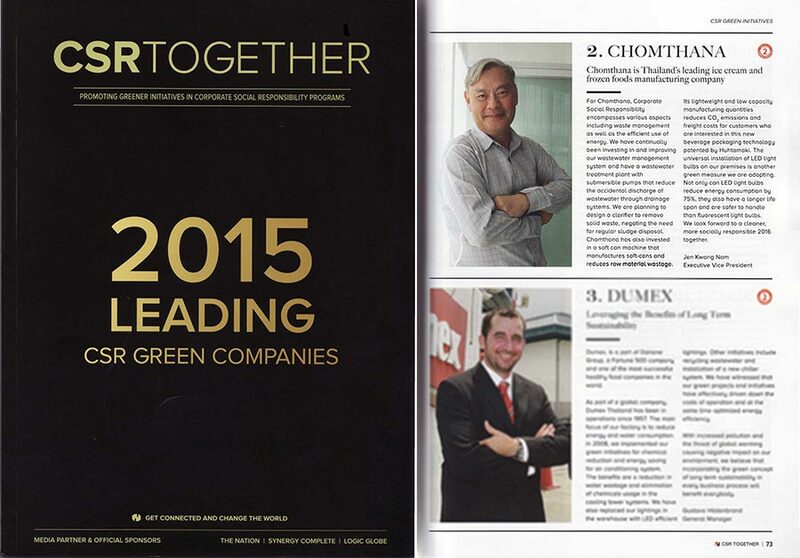 Chomthana was featured today as one of the ‘2015 Leading CSR Green Companies’. Published in coordination with The Nation newspaper, the CSR Together Initiative (http://www.csrtogether.com/) featured over 100 companies in Thailand that are adopting green measures in their business practices. Founded by the CSR Corporation, a green media and IT company, the CSR Together initiative encourages companies to help create a greener and more sustainable future for this world. Companies from all sectors were featured in this 106-page booklet. Whether it be the installation of a waste water treatment plant, or the universal installation of energy-saving LED lightbulbs, Chomthana is continually seeking for opportunities to better fulfill all 4 of the CSR Together Campaign’s environmental goals. The goals are: water savings, chemical reduction, lighting energy savings, and air-conditioning savings. Chomthana aims to reuse all of its manufacturing waste water and to reduce its energy consumption by 2018. As a leading ice cream manufacturer with a large production plant, Chomthana has a duty and responsibility to protect the environment and its people. Citizens too can do their part in helping to reduce energy and water consumption in their home. Companies or buildings that have adopted green measures can become CSR members by visiting the CSR Together website: http://www.csrtogether.com/. The CSR Together Booklet is available today at news shops and bookstores with a copy of The Nation. Chomthana looks forward to a ‘greener’ and more socially responsible future together. 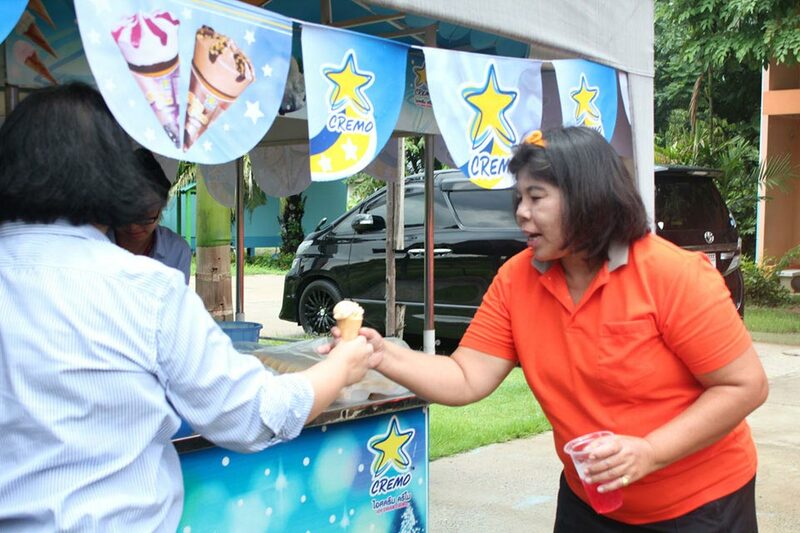 For a mother’s day special event, residents at the Half Way Home for Women in Rangsit, Thanyaburi, were treated to ice cream and buns by the Chomthana group. Celebrated nationwide, Thai Mother’s Day occurs on the 12th August every year and is a public holiday marking Queen Sirikit’s birthday. The Chomthana group, along with other local Thai volunteers, took part in a merit-making ceremony which involved donating and serving food to the charity. The Halfway Home for Women is a special shelter that looks after mentally or physically handicapped women undergoing rehabilitation. The shelter was set up by the Ministry of Public Health and the Ministry of Interior Affairs, together with the Department of Public Welfare. The women are of various ages and are trained in skills that will help them build a life once they leave the shelter. Despite the rain later in the day, it was a meaningful day for all the attendees. Special thanks to the organizers, Khun Apple and Khun Mai, as well as the volunteers and the charity.